Actors perform a stage reading of “The Whipping Man,” a Civil War-era play, at the Noyes Cultural Arts Center. Following the performance, community members discussed how themes of oppression are still prevalent today. A stage reading of a play set immediately after the Civil War sparked conversation about systems of oppression still prevalent in today’s society. Webb is the interim director of the Garrett-Evangelical Theological Seminary’s Center for the Church and the Black Experience and has received a masters degree in African American studies from Northwestern. 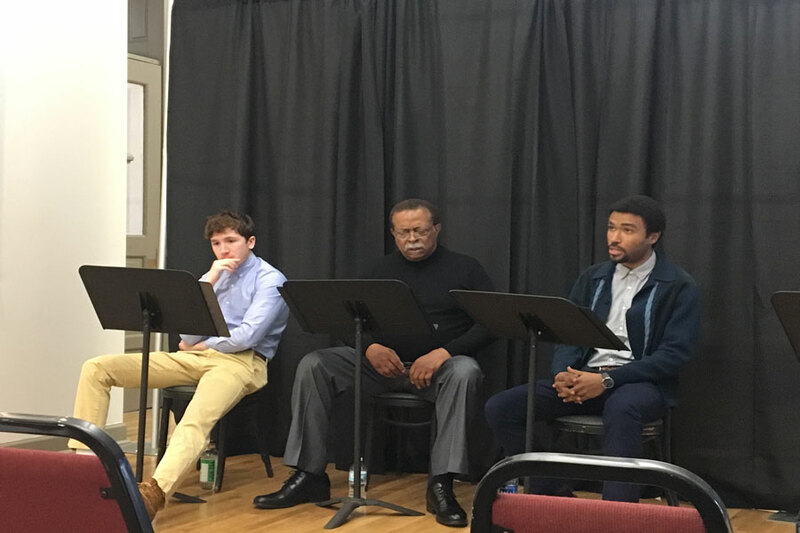 CBE partnered with the Fleetwood-Jourdain Theatre to produce a stage reading of “The Whipping Man” at the Noyes Cultural Arts Center as a part of Evanston’s celebration of Black History Month. The play is the second of a 10-part “Out of the African Diaspora to Evanston” series, organized by CBE. The project aims to educate community members about the history of black Americans through different mediums such as art and preaching. The play by Matthew Lopez is set in Richmond, Virginia, in April 1865. It describes the reunion of a young Confederate soldier with two of his former slaves after the end of the Civil War during Passover. Following the performance, audience members joined the actors to discuss the play’s themes. Cedric Young portrayed Simon in the play, a former slave who takes care of his master’s son after he returns from battle with a bullet wound in his leg. After the performance, Young said the theme of former slaves and masters attempting to understand their post-abolition relationships is still relevant today. Chicago resident Molly Burns said chamber readings such as “The Whipping Man” can be very powerful. She added that it was “interesting, ironic and slightly sad” that the play was set in Richmond, in light of the news surrounding Virginia Gov. Ralph Northam’s racist yearbook photo of one man in blackface and another wearing Ku Klux Klan garb. “It’s everyone’s responsibility to further our understanding about what people are going through and what people have gone through,” Burns said. Tim Rhoze, who directed the Sunday performance, said the play is a challenging piece because it was “rocking the foundation” of people’s preconceived notions about slavery. He said every attendee takes away something unique, but what is important is that viewers engage in thoughtful discussion.